Whether Christmas is a time of unbridled joy, a season of past reflections, or an ordeal to be endured until the return to normalcy after the New Year, its impact is pervasive in most of our lives. Everyone's feelings are super-sensitized, every emotion is heightened. The happy become giddy, the sad become despondent, the lonely become lonelier — unless, yes unless — the magic of Christmas has its way. So it is for the characters in these stories. They are ordinary people grinding through the ordinary events of ordinary Decembers. But they find a moment of Christmas magic in the midst of their misadventures that changes their perspective — making the ordinary slightly extraordinary. It might be a librarian enjoying her initial foray into "crime." Maybe it is two young men on the cusp of adulthood angsting over opportunities lost, or a wife-mother-daughter fed up with the constant, mindless flurry of the season. Can two buddies navigate their way between institutional and individual charity in the form of a Christmas turkey giveaway to the needy? Their occupations are as varied as the circumstances in which they find themselves. Any of these folks could be your neighbors, your coworkers or your best friends. They are not famous, nor super-rich, nor at the absolute brink of economic or emotional disaster. They don't win the lottery, but neither are they at the end of all hope. Their dramas are common to many of us, their human instincts familiar and their problem solving haunted by the ghosts of all their Christmases past, present and future. Gerald R. Toner, author of three previous Christmas story collections, again reminds us that small miracles are revealed during the holidays. Styled "misadventures of the season," these contemporary tales show us that the best Christmas gifts are not wrapped in colorful paper and ribbon, but arise from the human spirit. So pour a glass of Yuletide cheer or gather the family around steaming cups of hot chocolate and enjoy! Gerald R. Toner has practiced law for 35 years, specializing in the defense of Kentucky's medical community. He is a graduate of Harvard College and Vanderbilt School of Law. His short fiction has appeared in The Saturday Evening Post, Redbook, Ladies Home Journal, and Louisville's Courier-Journal. 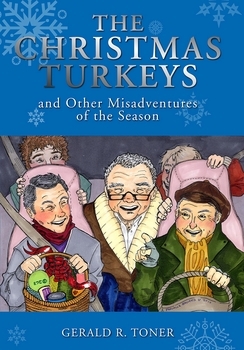 He is the author of three Christmas volumes: Lipstick Like Lindsay's and Other Christmas Stories, Whittlesworth Comes to Christmas, and Holly Day's Cafe and Other Christmas Stories, as well as a radio adaptation of The Christmas Visitation. He spearheaded the Kentucky Bar Association's Oral History Project, culminating in the publication of Kentucky Lawyers Speak, co-edited with Professor Les Abramson of the University of Louisville School of Law. His stories have been included in the collections Savory Memories and Christmas in My Heart. He lives in Louisville with his wife, Carol, where they have raised Jennie and John — now experienced world travelers. Pascalle Ballard grew up in the woods of southern Indiana, drawing pictures and making costumes that she imagined in the stories she read. Not a lot has changed, except now she has a BFA from Indiana University and a fierce case of wanderlust.